Because we care about your child's bodily health and well-being, we believe that reducing the amount of radiation exposure is extremely important. 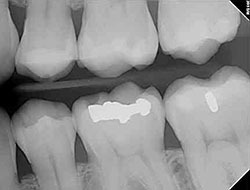 Although the amount of radiation used in dental X-rays is very small, the effect is cumulative, so all radiation counts. Digital X-rays can reduce your child's exposure to radiation by up to 80 percent! The digital images can be enlarged and manipulated, giving the doctor a clear, more detailed look at your child's teeth. It's better for the earth! There is no need to use harmful chemicals to process film. Our practice is focused on making your child's dental experience as comfortable as possible. At your next appointment, we'll be happy to answer any questions you may have.